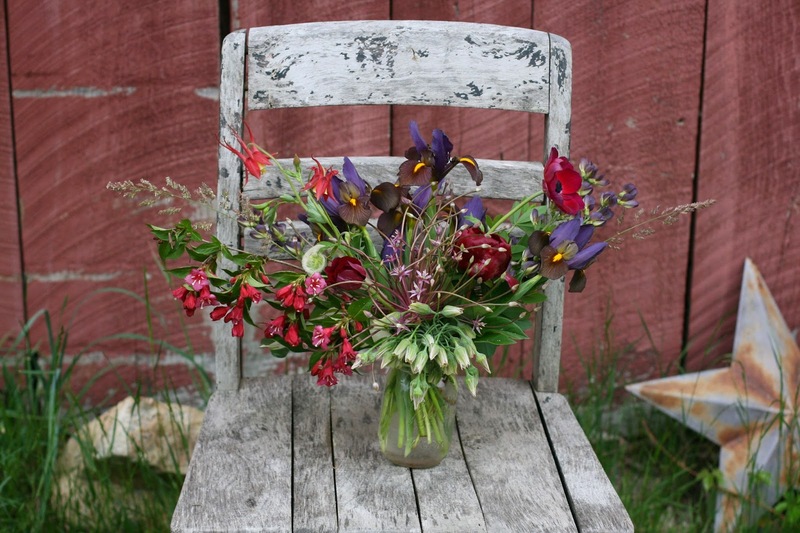 last summer, I got in the habit of leaving leftover flowers on an old chair outside of my workshop/barn at the end of the week. soon, I noticed a beat-up green truck stopping, gravel crunching, door opening, silence then a loud, peace-shattering exclamation as the woman scooped up the blooms and skipped back to her truck. this became a weekly ritual. I’ve come to learn a lot about her. she is my neighbor. she was in a terrible motorcycle accident and suffered severe brain trauma. she loves plants and brings me gifts more often than my husband is comfortable with. she howled when I told her that gomphocarpus was called “oscar’s hairy balls”. and her boyfriend of 16 years just left her, and she asked that I keep an eye out for her. today, I set a bouquet on the chair and dashed inside to grab my camera before rushing off to deliver it to the Ballard Institute and Museum of Puppetry. just as I reached the threshold, the familiar truck screeched to a stop and I knew. when I reached her, she was clutching the flowers, sobbing. I wish I was that thoughtful. I wish I had let her take the flowers. tomorrow I will leave one just for her, but it won’t be the same. Nice ideas on gifting you have shared with us. I think, Flower gifts are most attractive and beautiful to give someone.